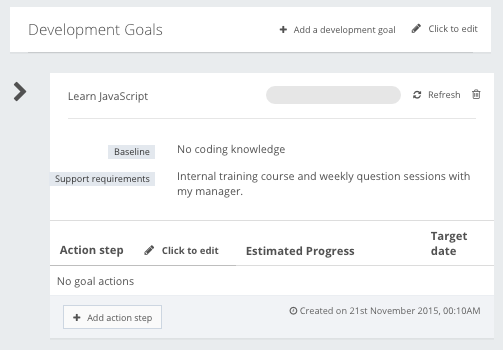 PeopleGoal | How do I create a development plan? Developing every employee to their maximum potential means your company benefits from better, more consistent performance and long term talent retention. As every employee's skills and areas for improvement are different, an individual development plan with input from the employee, their line manager and, if necessary, senior management, will help guide their progress exactly where they need it and will give them opportunities to develop the knowledge, skills and abilities to be successful in their role and future career. 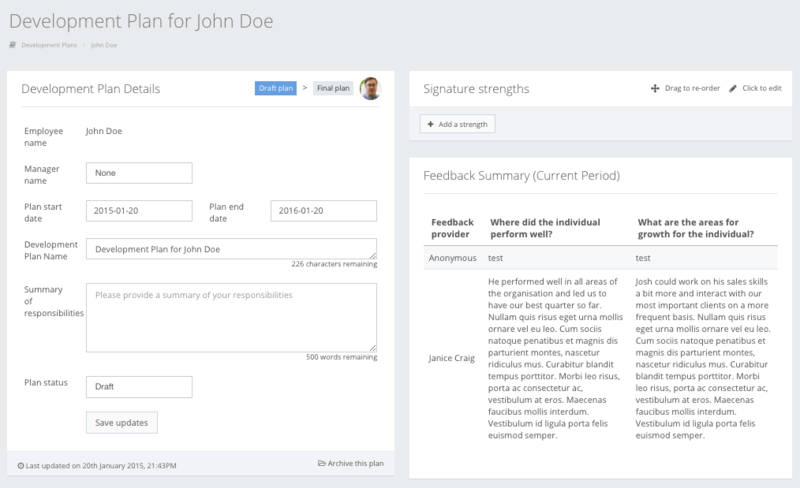 Development is an optional module that can be found in the sidebar once activated. Before creating a new development plan, your Development overview will outline the key areas you should consider for both yourself and your direct reports. The next step is to outline your Development Goals. These should cover the key skills and knowledge you need to progress in your current role and beyond. Identify your baseline, which is your starting point for the specified area of development. Support requirements can include any training courses offered by your company, or more personal support from management, mentors and coaches. Remember that Development Goals should, wherever possible, align with company objectives to ensure both the employee and business are getting the most out of individuals' development. Lastly, decide on 3-5 action points to support the completion of your goal and include a specific timeframe for achievement. 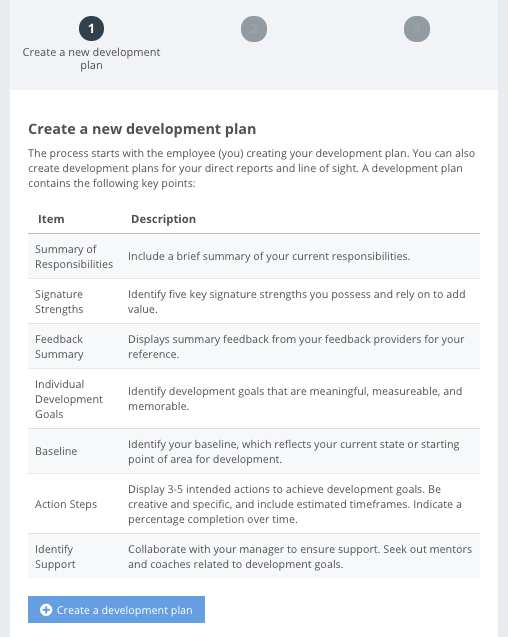 Once completed, your Development Plan will be displayed in the Development overview, and you can update your goal progress as you go and link key information to your performance review.